CSUN alumni Harry Sefton III '85 (Engineering), M.S. 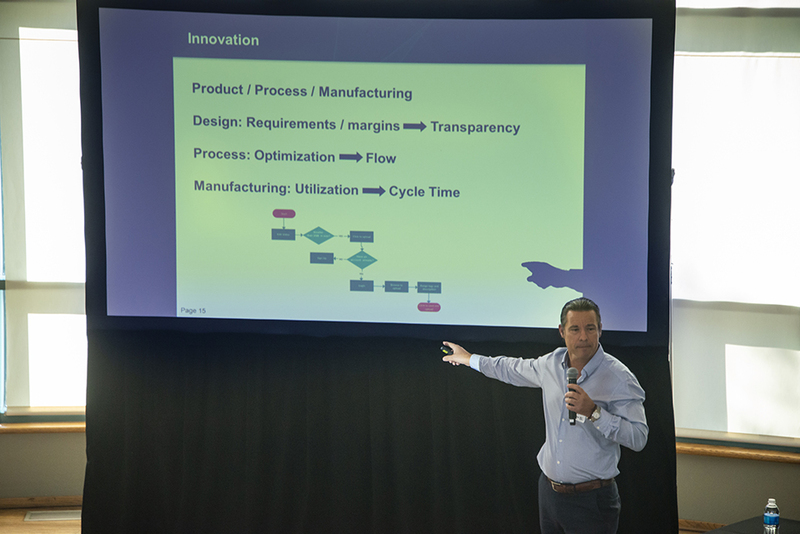 '91 (Electrical Engineering), a senior manager at The Boeing Company, served as keynote speaker of the Art of Innovation Conference. Photo by David J. Hawkins. CSUN President Dianne F. Harrison welcomes attendees to the Art of Innovation Conference. Photo by David J. Hawkins. A panel of CSUN alumni discuss big data, AI and machine learning. Photo by David J. Hawkins. The Art of Innovation Conference focused on trends, opportunities and best practices for launching new ventures. Photo by David J. Hawkins. Innovation is key to unlocking new systems, ideas and products. It is essential for all areas of business to thrive. To prepare its students for the workforce of the future, California State University, Northridge is fostering an environment for future innovators to thrive. 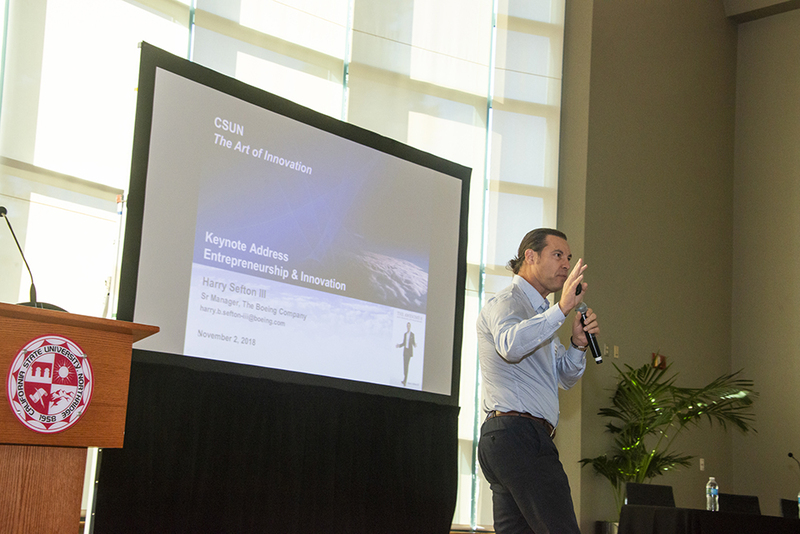 On Nov. 2, CSUN hosted its fifth semi-annual The Art of Innovation Conference to continue the university’s deep exploration of current and future trends of technology. Entrepreneurship, startups and tech are changing everything — including how we shop, how we get around, how we age, how we’re entertained and how we learn. The panel-style event included a broad range of entrepreneurs and business owners discussing these topics, including big data (large, complex data sets) and artificial intelligence (AI), as well as advancements in healthcare and transportation. 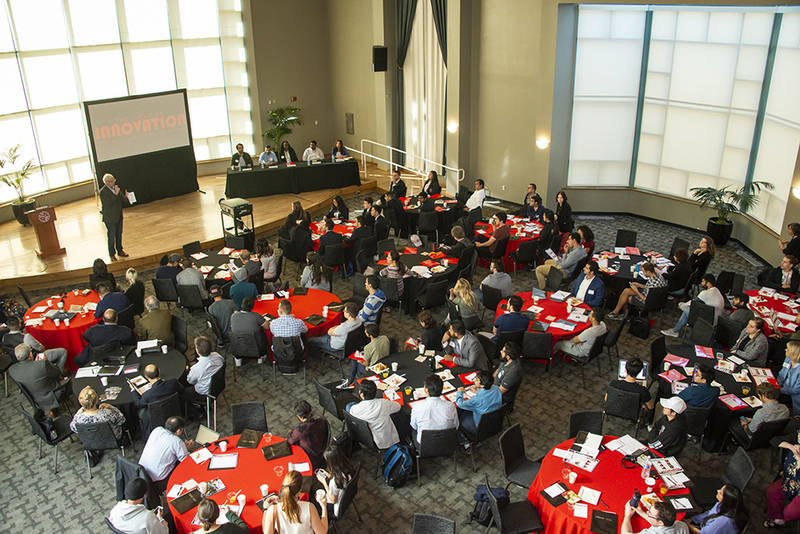 The conference focused on trends, opportunities and best practices for launching new ventures. The ultimate goal of the program is to spark ideas for entrepreneurial ventures and help build networks for all attendees — students, faculty, staff, alumni and members of the community — according to event organizers Ryan Holbrook, entrepreneurship program director for the David Nazarian College of Business and Economics, and Shereazad Jimmy Gandhi, professor of manufacturing systems engineering and management. 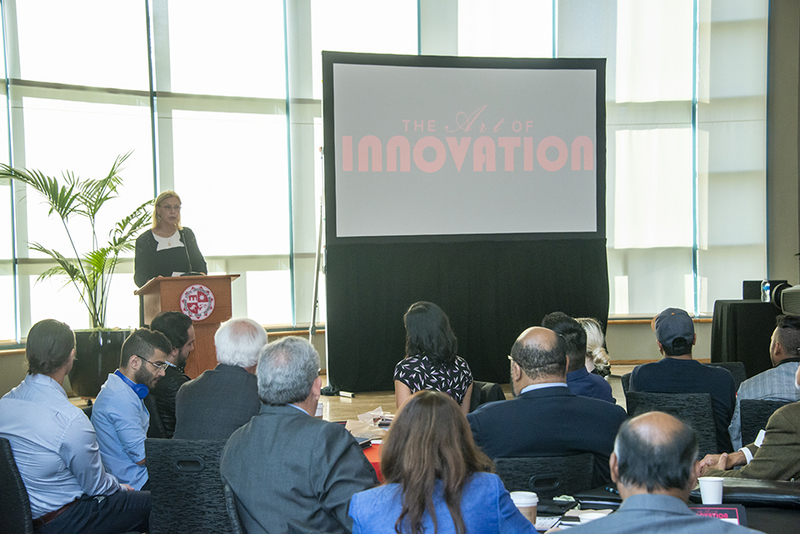 This event was hosted in collaboration with the College of Engineering and Computer Science, the David Nazarian College of Business and Economics, and the College of Health and Human Development. “At CSUN, we want our students to have the creative skills and talent to succeed in this workplace frontier,” said CSUN President Dianne F. Harrison, who welcomed attendees to the event. “We also know that the entrepreneurial mindset is one that looks beyond standard, functional boundaries and considers and fosters multidisciplinary collaboration. CSUN alumni Harry Sefton III ’85 (Engineering), M.S. ’91 (Electrical Engineering), a senior manager at The Boeing Company with more than 30 years of leadership experience specializing in commercial and government satellite systems, served as keynote speaker of the event. Executive and innovator Dale Deardorff ’84 (Art), M.A. ’87 (Two-Dimensional Art), M.S. ’93 (Industrial Engineering) introduced a panel of CSUN alumni who discussed big data, AI and machine learning. 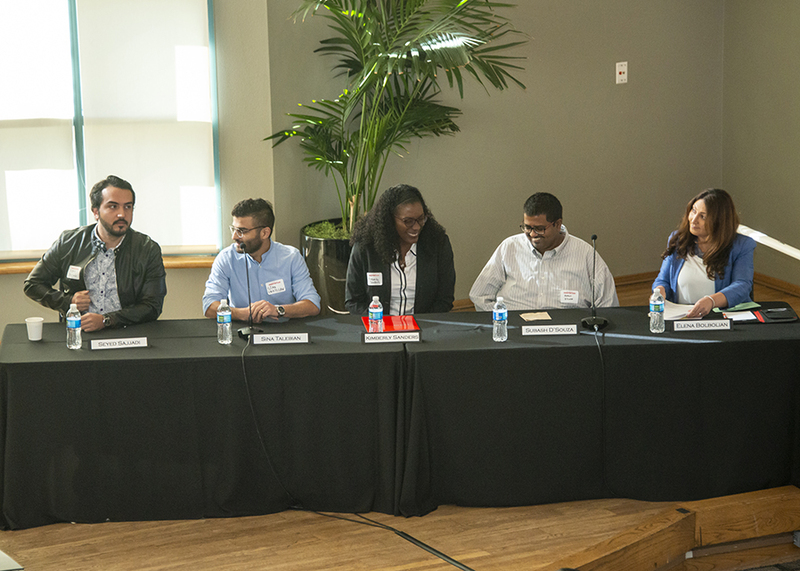 The panel included Kimberly Sanders ’95 (Afro-American Studies), director of global TV distribution at NBCUniversal; Subash D’Souza, director of data and operations at Warner Brothers; Elena Bolbolian ’05 (Public Administration), civic innovator for the City of Glendale; Seyed Sajjadi ’18 (Computer Engineering), a systems engineer at NASA; and Sina Talebian ’14 (Engineering Management), a data scientist at Versus Analytics. The panelists all noted that AI is everywhere. Sajjadi said that big data is the new norm, and he discussed a commonly used type of data called sentiment analysis data. Another panel discussed the topic of telemedicine, which is the use of telecommunication to provide healthcare anywhere, removing the necessity to go to the doctor’s office. Telecommunication enables services such as in-home medical devices, virtual consults, chatbots to answer questions, and interactive education, aiming to streamline care by making it more convenient for patients. In addition, medical apps are offering digital cardiac monitoring, diabetic monitoring, and exercise and diet plans for patients to monitor and improve their health. A team of students from UCLA Anderson, including panelist Hadley Washburne, are part of a startup offering monitors that allow at-home ear-infection checkups for children (administered by parents and guardians). The day’s final panel focused on the future of transportation and was led by Jeff Joyner, attorney and co-founder of Uscooter, a folding electric scooter. The panelists included alumna Flaurel English ’79 (Psychology), founder of Gridlock Solutions and executive advisor to the Toyota Mobility Foundation; Ian Gardner, president at Chanje, a startup manufacturing the first medium-duty, all-electric commercial truck; alumnus Terenig Topjian ’08 (Art), founder of Have A Go, an electric scooter company; and Rick Teebay, transportation specialist for Los Angeles County. The panelists discussed the current dynamics of transportation, including the issues and benefits of electric scooters, future transportation technology, how officials in LA and across the nation are rethinking urban mobility — as well as the importance of future innovators, creators and engineers to continue to develop future transportation options and solutions. Organizers and participants said the conference aimed to inspire and prepare CSUN students to face challenges that can be solved by technological innovation.